We were Rachel’s teachers in Local Knowledge, an interdisciplinary, full time program that carried through the academic year 2001-2002. When Rachel was killed in Gaza on March 16, 2003, we, like so many others, had to come to terms with the shocking reality of a promising life cut short. We are grateful to her mother, Cindy, who said, “Parents can be awakened by their children,” to her father, Craig and sister Sarah, and to the staff of the Rachel Corrie Foundation who have honored Rachel’s commitment to justice for Palestinians, her love of writing and expressive art, her focus on community connection, and her search for ways to engage in social justice work with her neighbors. We are reminded of the lessons we shared and poked and prodded with Rachel. So many words and ideas, so many acts and attempts at discovering our own ability to act, and collaborate, and build and discuss. Studying the history of this area roots me. It makes me more conscious of the land and more conscious of myself and of the people around me as actors in history…We’ve certainly waded in the same water and wandered on the same beaches as some very brave people. Remembering Rachel is not so much a set of commemorative moments as it is a continual, ongoing journey. Our experiences with Rachel, in the classroom, at the awful moment of her death, and throughout the last 15 years raise fundamental questions about the rewards and perils of engaged learning. How can we create supportive learning moments and journeys that keep students safe, while at the same time making the classroom porous and permeable to the world? What are the implications and potential consequences of encouraging students to actualize their learning in the communities they are a part of, or seeking to become part of? How do we serve as guides and witnesses to our students as they learn to contribute their skills and vision to a troubled world that sorely needs them? We live in a curious geography…we have instantaneous access to products, information and currency from anywhere on earth. On the other hand, we are often separated from the consequences of our actions by thousands of miles, strings of subcontracts…and a long parade of…ATM machines. This fracture deserves further examination. Its relationship to the way we form knowledge, and how we act on that knowledge is relevant to …our ability to function in a democracy. In Local Knowledge students started community gardens, volunteered in food banks, participated in environmental movements, made films about homelessness, started a local peace organization, and much more. The rich variety of the work was—and is—united by their understanding that colleges are not outside the struggles communities are engaged in. This has never meant that all students are expected to participate in political activism, but rather that students are supported to seriously consider how their sense of their work, as it evolves, coexists with and interacts with a world that needs them. In turn, students and their faculty have much to learn from the broader community about resilience, survival and sustainable solutions to profoundly vexing problems. Rachel’s peers understood the relationship between her work and theirs, a relationship they embraced in the painful days following her death. She was willing to sacrifice everything she had been taught by popular culture to cherish – comfort, blind faith, complacency – and elevate herself to a place of transformation and compassion. She died, but we still have each other, the impact of her presence and commitment, the lessons we shared, and so much work to do. Today, 15 years later, we remember Rachel for her passion, her quiet fire, her determination. She was not a tower of certainty, of unmovable thinking. She was a seeker, who asked a lot of questions, who asked a lot of herself and who knew there is always more to learn, more to question. In her readings, writings, conversations and daily actions, she was on “the search.” For us, Rachel is less of a symbol and more of a flickering beacon, a gesture to the rest of us to keep pressing on with our efforts. She was both courageous and careful. When learning about her home-community, she realized how much she had not seen, so she pushed to learn more. When learning about Palestine, she was a respectful visitor and student of the people who hosted her. Hers was a learning-life; she pressed beyond the borders of her experience to understand how others, in other parts of the world, struggled and persisted. Reflecting the perspective and necessity of a learning community that began in the throes of 9-11, she looked close to home and far away, always figuring out connections, the alternative to the rhetoric of “us or them.” In Gaza she used her much-vaunted privilege to understand others and tell the story of her learning through articulate, determined and grave messages that urged others to feel connected—and to continue to learn. We remember Rachel’s youth and insight, her wisdom, and determined search for a better way. 15 years later we often wonder: what would she be learning and saying now in a landscape where so much has changed, yet where so much remains to be done? In Palestine she was deeply connected to the youth, the children who have been denied so much, who hunger for justice. Today, she would no doubt champion the young Florida students who are speaking out against gun violence, demanding that it be challenged and prevented. She would embrace the courage of young people protesting police violence in Black communities, and the undocumented youth who are bravely advocating for immigrants rights and political/social inclusion. Young people speaking-their-minds was vital to Rachel and to her legacy. We learned from Rachel that parents can be awakened by their children, and teachers can be re-awakened by their students. That is part of the legacy we live out as we remember Rachel. We try to be attentive to what might be forgotten, overlooked or excluded. We remember how important it is to speak out, as Rachel did, to take a stand, as Rachel did, and to keep observing and asking questions. We look for connection and seek out opportunities for engagement. And we continue to be inspired by the words of her friends-in-learning, who embraced her challenge to do right by her world. Learn and speak, turn to each other and organize, right where your community needs it most. This is how to honor the humility of [her] death, not with banners and songs and slogans, but with strength, intelligence and critical compassion…she was extraordinary and ordinary; she cared about the world and threw herself into it, she was one of us. UN World Day of Social Justice: Where is the justice for Palestinians? Observing the UN World Day of Social Justice: Where is the justice for Palestinians? It would be remiss to recognize the UN World Day of Social Justice, February 20, without a discussion of the Palestinian people. Their economy, their land, and their livelihoods have endured Israeli occupation for over half a century, restricting Palestinian mobility and creating conditions of hardship, of violence, and lack of autonomy. The UN has attempted to reproach Israel for the Occupation since its inception, yet it continues. A day such as World Day of Social Justice harnesses the growing visibility of social activism, but why has progress from the UN regarding Palestine been so slow? The UN World Day of Social Justice was established 10 years ago when the International Labour Organization adopted the Declaration on Social Justice for a Fair Globalization. Individual member states, including the United States and Israel, agreed to promote fair labour practices and to recognize the importance of national interdependence in economic affairs. However, the enormous economic power and influence wielded by the US as a member of the UN curtails many efforts by other member nations to hold the United States and its partner Israel accountable for the Occupation. This year’s World Day of Social Justice theme is, “Workers on the Move: the Quest for Social Justice,” noting that “most migration today is linked directly or indirectly to the search for decent work opportunities. Even if employment is not the primary driver, it usually features in the migration process at some point.” With these ideas in mind, where is consideration for the Palestinian worker, unable to leave the West Bank or Gaza because of occupation? At the end of 2017, the Palestinian Central Bureau of Statistics reported that almost 30% of Palestinians were unemployed, with the largest percentage being college graduates at almost 50% unemployment, as reported by Ha’aretz. Moreover, in Gaza, public employees have seen a sharp decrease in employment and salary, as reported by The New York Times, as a consequence of Israel reducing power, reducing trade permits, limiting imports to Gaza, and deflecting responsibility through political finger pointing at the Palestinian Authority and Hamas, a moot argument when it is acknowledged that the ultimate responsibility lies with Israel, the occupying force. The United States shares culpability for this increasingly desperate economic state, as it continues to send billions of dollars to Israel to fund its military operations in occupied Palestinian land, and historically has shielded Israel from UN Security Council Resolutions attempting to condemn the Occupation. Recently, the US has also threatened to withdraw millions in relief aid funds from UNRWA to Palestinian refugees — funding that, in addition to providing for basic humanitarian needs, also supplies educational, employment, and economic opportunities in Palestine. This threat came as a response to the UN trying to exert pressure on the United States for recognizing Jerusalem as the capital of Israel. While it is reassuring to hear that the UN condemns the United States and Israel for their counterproductive policies, we encourage the world to ask about other options the UN can explore to hold these two powerful nations accountable, despite the imbalance of power. We at the Rachel Corrie Foundation share the UN’s belief that “social development and social justice cannot be attained in the absence of peace and security or in the absence of respect for all human rights and fundamental freedoms,” and we recognize the paralyzing imbalance of power and influence that exists within the UN. We support the attempts that member nation-states have made to rein in and hold the United States accountable, but on this World Day of Social Justice, we challenge the UN to use its collective power to employ concrete actions to bring peace, security, and economic freedom to the Palestinian people. What a year! RCF is celebrating milestones and planning for a great 2018! The salmon are significant to us in the Pacific Northwest, particularly this time of year when they make the journey home to streams where they were born. The rains return to our corner of the country in November, too. This past weekend, we took advantage of a burst of sun to walk at a favorite, nearby nature trail. This is a place we randomly visit most every season, to witness the cycles and changes in our natural world and to consider the parallels in our own lives. It is a place where memories come flooding back – of family holiday walks, field trips with preschoolers, and of rare sightings of beaver and wood ducks. On this visit, the parking lot was full, because the salmon had returned. At multiple viewing points, hundreds were fighting their way upstream, to lay and fertilize their eggs, to take their last breaths, and to let the cycle begin anew. When we witness this phenomenon, we think of Rachel – of all she learned, thought, and wrote about the salmon and this place where she grew. And we think of the Palestinians to whom she connected us – of the determination, persistence, and pain of their struggle. 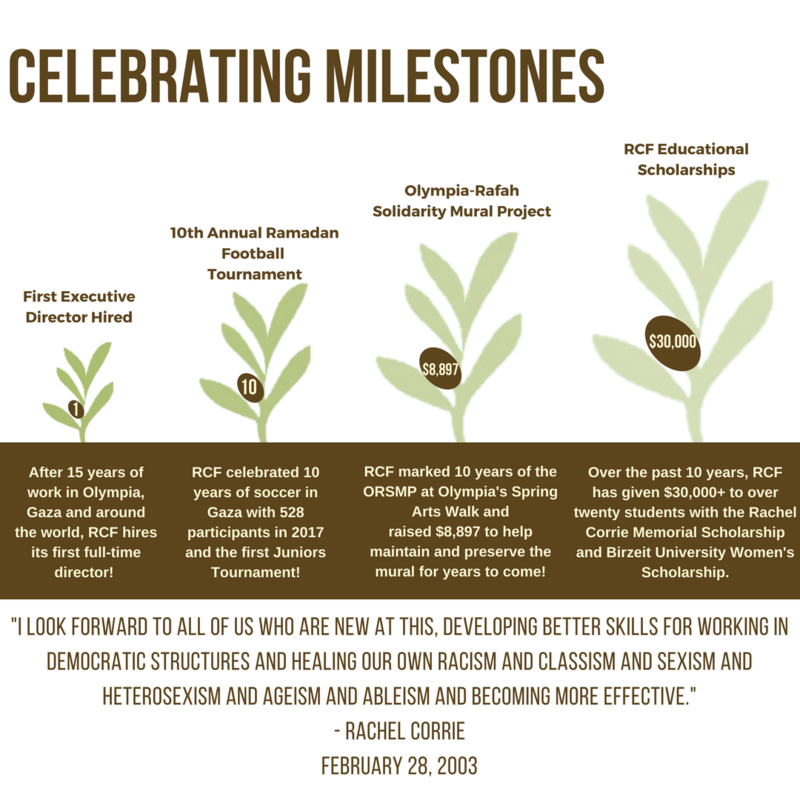 This has been a year of hard work and change at the Rachel Corrie Foundation. We’ve educated, advocated, and made connections as we’ve continued to pursue the elusive peace with justice in Palestine/Israel that has been our campaign since 2003. But we’ve also turned our attention to sustaining the Rachel Corrie Foundation and ensuring that it continues to advance the values that Rachel championed, now and long after there is resolution of Palestine/Israel. We’ve hired our first Executive Director, Whitney Faulkner, who is working eagerly with our board, staff, committees, and volunteers to lead the way. These are challenging times on many fronts, and the challenges are connected. 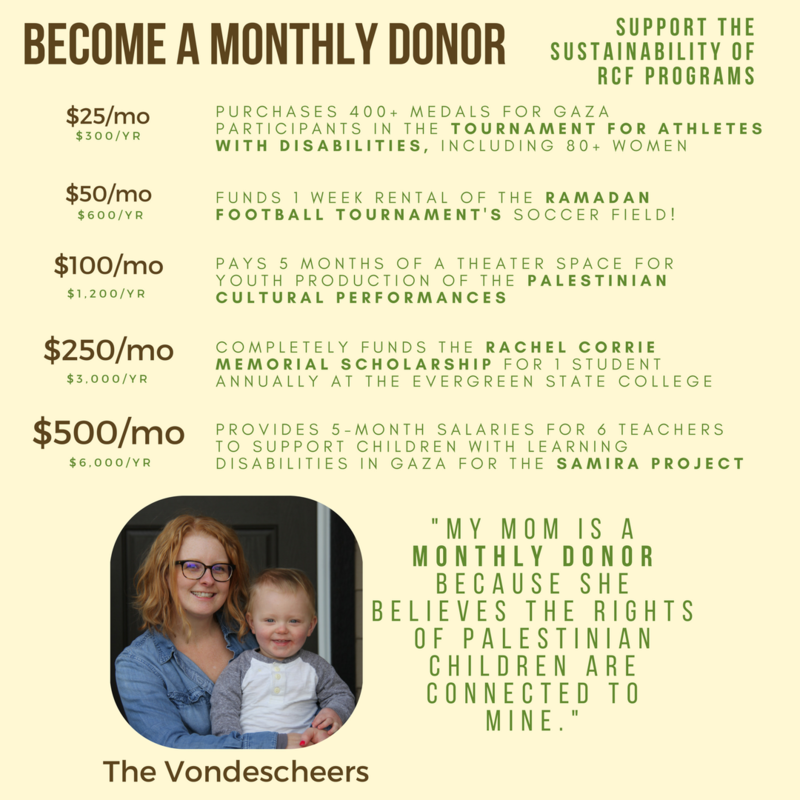 At the Rachel Corrie Foundation, we need you to join us in recommitting to Rachel’s vision of a world where communities are linked globally, where universal human rights are prioritized, where all people are respected regardless of race, gender, nationality or religion, and where peace is possible. Many friends and colleagues are working for this same vision across the globe. As we join them, we will always remember that our own efforts began with Palestine and must remain there. We will work toward our shared vision through the lens of Palestine. Your participation is critical this coming year and in the future. Your engagement, ideas, time, and financial support will determine what we accomplish. As we move into the giving season and a new year, let’s be inspired by the persistence and commitment of the salmon struggling upstream to create life in the creeks where Rachel learned and played. Let’s keep struggling together – to change the realities on the ground in Palestine, to sustain the Rachel Corrie Foundation for years to come, and to realize our shared vision for our planet’s future. I am honored to be able to write to you during this holiday season, as Rachel Corrie Foundation’s first Executive Director. Thanks to a generous bequest by the late Irma Giustino Weiss, RCF was able to create this position which allows the Corries to take a step back from the day to day operations of the office. This is an exciting transition for the Foundation designed to strengthen RCF’s movement toward greater sustainability and growth. Your valuable generosity has offered the Foundation’s staff, Board Members, and volunteers the opportunity to further the work that Rachel started. As the holiday season approaches, please consider giving the gift that keeps giving by becoming a monthly donor or providing a gift in a loved one’s honor. Your investment in the Rachel Corrie Foundation will continue to move forward the work that Rachel started. Click the link below to read our 2017 Summer Newsletter!